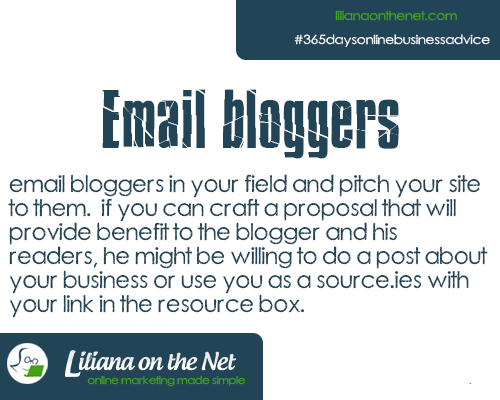 If you can craft a proposal that will provide benefit to the blogger and his readers, he might be willing to do a post about your business or use you as a source. 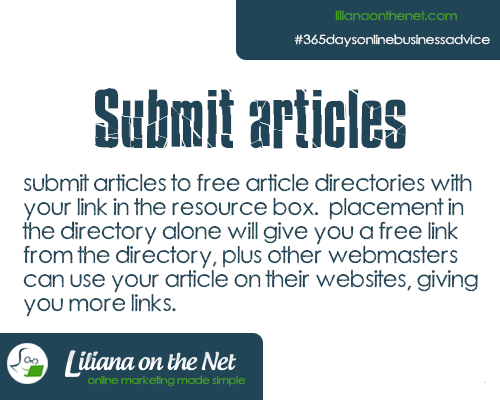 Placement in the directory alone will give you a free link from the directory, plus other webmasters can use your article on their websites, giving you more links. This technique used to be all the rage years ago, especially as the link building was of vital importance. In 2012 in one of the updates Google penalized excessive links of poor quality. Article directories are still relevant but it is best to have a mixture of links: article directories, guess posting, blog commenting and press releases. The moral is simple: spread your marketing efforts for link building. Article writing technique is similar to writing blog posts or guest posts. Original: not merely a copy of another. Professional: good spelling and grammar (my husband helps me here as I have a terrible problem with my “ons” and “ins”. Entertaining: I used to write lectures, if you read the beginning of this blog 🙂 Last year’s articles were merely a lecture. Now I try to be conversational and wherever possible I do apply these 365 tips to what I use now. Informative: it must teach the audience something new or give them new resources. • The 10 best ways to save for retirement. As the name implies, this is where you share one or more tips. • 7 weight-loss tips that will melt 10 pounds of fat. A “how to” articles is used to teach the reader how to do something. • How to use Google AdWords. A case study article is where you take a scientific approach to testing something – such as a new product – and then reporting your results. These articles are motivational as they show the reader than results can be achieved. You are reporting results and facts and motivating at the same time. This is another “facts and figures” type article. Instead of doing any studies or experiments yourself, you turn to academic and scientific literature to come up with an article. • What is the smartest breed of dog? A response article is also called a “trackback article,” because you use trackbacks to reply to another blogger’s or article writer’s article. • A blogger rants about a particular problem. You respond with a solution. A rant is just what it sounds like – an emotional article, often one where you “complain” about a problem and although this sounds pretty simple, these are often the most popular articles on your blog. • Why the gurus got it all wrong. A presell article is basically an advertisement. This is where you tell your readers, “I recommend this product and here’s why…” (followed by a list of reasons and benefits why it’s a good product). You can even copy and paste bullet points directly from the sales letter, if you have permission. Tip: For best results, write from the heart rather than hyping it up. If your readers know, like and trust you, then they’ll buy the product just based on your honest recommendation. Another rather direct way to sell a product is by writing a product review (or a comparison, if you review and compare two or more products). This article format can be used with just about any other format. Basically, the idea isn’t just to make one post – it’s to make a series of articles (at least two articles, but preferably more). The reason is because you want your readers to get “hooked” on the initial articles… and then eagerly return to your blog again and again for the next article in the series. • Ten part series showing people how to write a sales letter. • 52 part series (once per week) showing people how to lose weight. It is very important to remember that doing community service is not about being charitable it is just about helping the needy. It is also about the health and well being of the people getting involved in community service. It is for the good of the community and the people in it, including you. Also, do not use it just for networking. 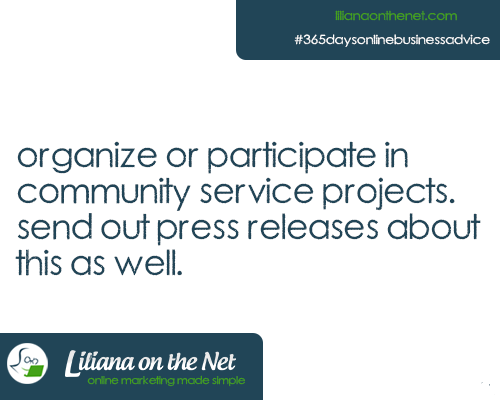 You need to give to the community and the chosen service first, networking will come naturally. You don’t need to sell your online business or questions, after you form relationships opportunities to talk about what you do will again come naturally. Anything that benefits the community, sometimes it is targeted to just one section of the community. Making the parks within the city more attractive. Offer your time to one of the Charity stores in your area. Painting a neighborhood school, mending fences and tidying the park. Local churches often are grateful for any type of help. Organizing meal delivery for the sick and infirm in the community. Organize a weekend soup kitchen. Organize a fitness weekend in a park to highlight the importance of healthy living. Assemble backpacks for the needy. Collect food donations at local shops for the unemployed and homeless. Organize rotas for visiting the elderly daily. Well I think you get the idea. You could offer free classes on any niche of the Internet Marketing IM or Make Money Online niches. Offer them to everyone or target your market such as: unemployed, mums, retirees etc. Eg. Are you an eBay or Amazon expert? Promotion of you community service event. Promote it in your social media accounts. Send press releases to local press. Print posters and ask local businesses to display them free. After an online marketing event you’ve created, blog about it. I am sure your readers will learn from your event and will be grateful about the ideas and I am sure many more communities will benefit from similar events. I am sure it will be so satisfying that you will want to make it a regular event. Send out press releases about this as well. 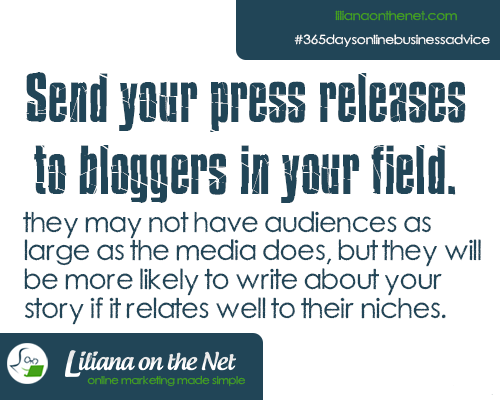 Send Press Releases to Bloggers in your Field. This is the third and last of a series of Press Release tips. You can read the first tip by CLICKING HERE (you can find a list of 10 Press Release sites and also a Fiverr gig that might help you). You can read the second tip by CLICKING HERE (here you can read the benefits of Press Releases). Send Press Releases to Bloggers. They may not have audiences as large as the media does but they will be more likely to write about your story if it relates well to their niches. This would be equivalent to a guest posting in a blog. Also you are providing them with content for their blog. If the press release is regarding a product launch, give the blogger the chance of entering a joint venture with you and earning an affiliate commission by posting your press release on their blog. Bloggers are always looking for more ways to monetize their blogs. Remember you only have the headline and first paragraph to grab the reader’s attention. Your headline and opening paragraph should cover your message. The remainder of your Press Release should give the detailed information. Journalists receive thousands of press releases a day. They will only publish your press release, only if it requires minor editing. Basically what are the benefits for them? Your audience is sophisticated and can tell whether something is a lie or not. Make your content natural and factual. You can tell by reading that if it seems too good to be true, tone it down. You need to make it natural and real. Verbosity distracts from your content. Do not use extra adjectives and certainly do not use expressions like “The most powerful”. The best approach is to communicate your message neatly using regular language. If you really need to have an exclamation point, use only one. If you use testimonials in your Press Release do not forget to ask for permission. Some other business might have given you the testimonial for a specific product or service. These are often featured in the business section of TV, radio and online news sites. 2. Launching a new product line? This is an occasion worthy of a press release too. All businesses whether large or small need more publicity – press releases are one very good way of raising the awareness a business. With online press releases you can reach targeted audiences. They are inexpensive relative to the benefits they can bring, even if you have them written professionally. They assist your brand to be seen as an expert. Remember customers trust experts and are more likely to buy from experts. Furthermore, if you become and are seen as an expert in your field people will seek you out for interviews and blog posting. You are in the news. Most people read news online nowadays. Remember among those people are your customers! Inaccurate or poorly written information in an official press release might affect the business adversely. Today is day 5 of the book I’ve been reading. The book is: The Go Giver, A little story about a Powerful business idea. You can search for it in Amazon. I have in the main, been a giver but a really bad receiver, most of the time, as I have felt embarrassed. No longer, as it doesn’t matter if you receive from someone you have not given to before as you should not keep tracks, you owe me, never should be used when asking….. I will never again think when I receive, that I have not done anything in return as time will bring opportunities. Customer appreciation days are always good in the absence of a special occasion. 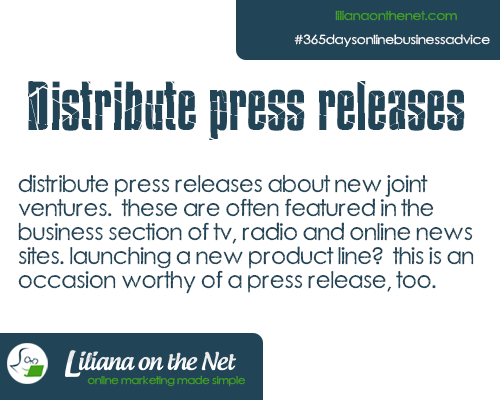 Press releases are again, a very important aspect of marketing your online business. The aim of the press release is to continue winning the trust of your current customers and make future prospects, aware of your company’s services and / or products. They must grab the readers attention, not many people will have the time to read lengthy press releases. Although these tips are targeted at online marketing for online businesses there is nothing to stop you releasing your Press Releases to local press if you have an online business that serves the local community or even an offline business. Today is day 4 of the book I’ve been reading, I said I was finally reading the book that my mentor had advised to read. I will disclose the book in my 2 February post. I was brought up in a Latin Country, where we seem to be more demonstrative, well physically anyway as we tend to kiss more than in Northern Countries. Well today I was myself, not that I stopped being me in the past but I was more myself and if I felt that I needed to give praise to anyone I did. Sometimes, I might stop myself and think would that person take it in the right way? I will always be myself.